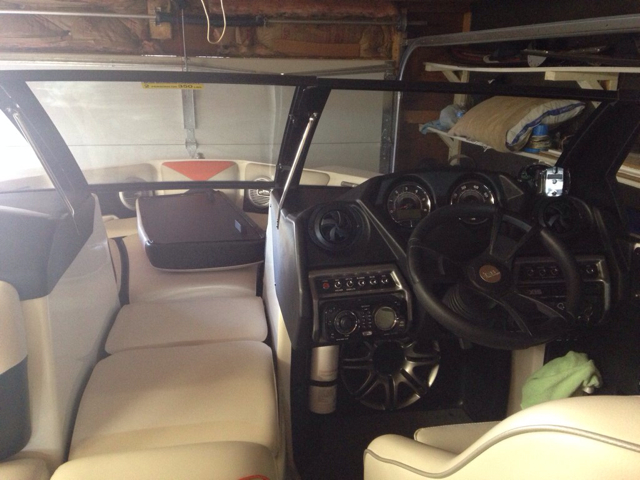 Sitting in my new boat, waiting for the lake to open on May 1st. I'm half temped to go get a fake lake and rev it in the drive way. I've buffed and wiped down every inch of it 20 times. It's only been in the water once. Hope the beer is cold. How about you break out the heat gun and peel those nasty warning stickers off. That will keep you busy through one beer. What's worse? Having the boat and crappy weather? Or boat sitting at dealership with perfect weather? I'd take my boat in some crappy weather. Setting in the boat with an ice cold beverage, a little Freebird playing on the stereo, Close your eyes and just add water. Bring it on. I stripped all those decals off mine too. Our local dealer spotted it & told me the one on the transom about not running the engine while people are on the swimstep due to the exhaust fumes...... apparently it's a state law that you have to have that one. He gave me another one & I threw it in the glovebox with the registration for the day Johnny Law actually wants to ding me for not having that on the boat. Then I'll pull it out & slap it on there for him. Sorry to hijack...do you guys use goo gone or goof off products to remove sticky residue from gel coat? Yeah, Messed that up by forgetting to fold the tower mirror all the way down. I'm surprised it didn't mess up the mirror. I used a Mr Clean Magic eraser to get the goo off. Use goo gone. It works perfect. Dab a little on a rag and rub gently. It will come right off. I've used them both & find they will both do the job. But Goo Gone smells a heck of a lot better..... like citrus. And if you use heat to remove the decal, then a lot of the adhesive will go with it.